ABSTRACT. The Pisco-San Andres area (13°44'S, 76°13'W) in central Peru is known for a traditional historic sea turtle fishery. To determine if illegal captures and black market trade exist, we carried out bi-weekly sampling in dumpsites and coastal areas from 2009 to 2015. A total of 953 carapaces were encountered, which included mainly black turtles (Chelonia mydas, 92.2%) and to a lesser extent, olive ridley turtles (Lepidochelys olivacea, 4.3%), leatherback turtles (Dermochelys coriacea, 1.4%), and a single hawksbill turtle (Eretmochelys imbricate, 0.1%). The mean curved carapace length (CCL) was 59.1 for black turtles, 60.4 for olive ridleys and 113 cm for leatherbacks. For all species, most of turtles reported were juveniles and came largely from illegal captures (89%) and not from stranding reports (1.4%). Mean mortality was 8.1 carcasses km-1 year-1 at beaches and 160.2 carcasses year-1 at dumpsites. Main consumed prey items in black turtles were silverside fish eggs (47.9%), Chondracanthus seaweed (31.4%) and Paranthus sp., anemone (16.2%). Despite the big sampling effort, mortality estimates could be underestimated since big percentages are butchered and discarded at sea. Still, numbers remains high with almost 1000 turtles in a five-year period and an illegal trade persists. Urgent measures are needed to recover this endangered species. Keywords: Chelonia mydas, illegal captures, black market, Pisco, Peru. The sea turtle consumption in the Pisco, San Andrés area (13°72'S, 76°22'W), ~130 km south of Lima has a long history. Records go back to the pre-hispanic era (4000-2000 AC), when around 30 turtles were reported from an archaeological site around Paracas (13°83'S, 76°25'W). During the Middle Ages, the Spanish Jesuit chronicler Bernabé Cobo reported the capture of ~90 turtles with a beach seine in Pisco (Frazier & Bonavia, 2000). Later, during the 1960s and 1970s, a report (Frazier, 1979) on the current state of the sea turtle fishery in Peru and the East Pacific, stated that the greatest numbers of turtles were captured in the port of Pisco, roughly 142 ton were landed, representing more than half the landings for the entire country from 19651976 period. But it is during late 1970s when a sophisticated turtle trafficking network thrived in the Pisco area. The fishery was operated by 7 to 10 boats exclusively dedicated to catch sea turtles, using nets specially designed to catch turtles, and with a well-established trafficking structure. The average catch was between 10 to 30 turtles per vessel per day and the captures were mainly composed by green turtles and, to a lesser extent, leatherbacks (Frazier, 1979; Hays-Brown & Brown, 1982). During the 1987 El Niño up to 110 boats were recorded landing turtles in Pisco (Zeballos, pers. obs. ), standing as the largest sea turtle harvest ever recorded in Peru. In just 10 months, over 20,000 turtles were landed (Aranda & Chandler, 1989). Sea turtle extraction was a legal activity until 1995 when a total ban on use of all the sea turtle species was established by Peruvian legislation (Morales & Vargas, 1996). However, the hunting still continues in Pisco by means of incidental and directed illegal captures as was preliminary evidenced (De Paz et al, 2002, 2004, 2007; Quiñones et al, 2010). In order to collect evidence of sea turtle illegal captures in Pisco, the regional laboratory of the Peruvian Marine Research Institute (IMARPE) conducted an assessment. 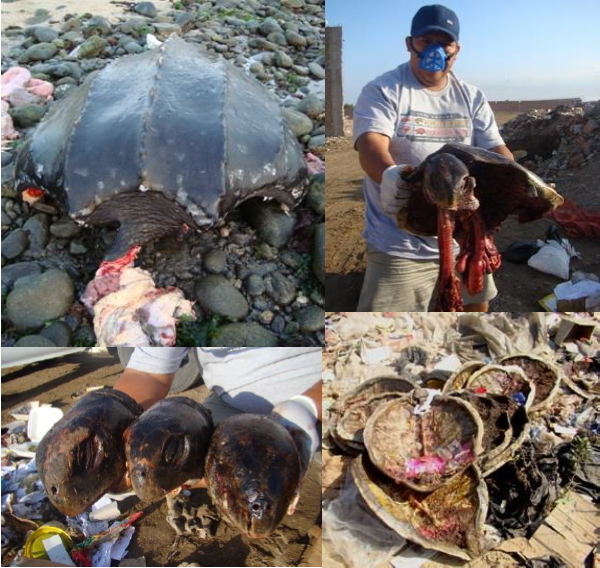 From November 2009 until March 2015, bi-weekly visits to local dumpsites and local beaches in the surrounding area of Pisco and San Andrés were conducted and all encountered turtle remains were registered and geo-referenced. The carcasses, carapaces and stranded individuals were identified to species level and the curved carapace length (CCL) was measured and registered. For black sea turtles (Chelonia mydas agassizii), life stages were characterized as follows: juvenile (<69 cm CCL), sub-adult (>69 cm and <85 cm CCL), and adult turtles (>85 cm CCL), according to the minimum breeding size (CCL = 69 cm) and mean breeding size (CCL = 85 cm) reported for 1037 nesting females in the Galapagos rookery during 2004-2007 (Zarate et al., 2013). For olive ridleys (Lepidochelys olivacea), individuals >57 cm CCL were considered adults, using the minimum size reported for nesting females in Nancite, Costa Rica (Marquez, 1990). For leatherback sea turtles (Dermochelys coriacea), individuals >123 cm CCL were considered adults, using the minimum size reported for nesting females in Parque Nacional Marino las Baulas in Costa Rica (Reina et al., 2002). In the case of hawksbill turtles, individuals >66 cm CCL were considered adults, based on the minimum size reported for nesting females at Estero Padre Ramos in Nicaragua (Altamirano et al., 2014). All carapaces were painted with red spray to avoid recounting. To identify the primary anthropogenic-derived threats for green turtles, the type of record obtained was used to determine the potential cause of death. If encountered at a dumpsite the turtle was considered to have been illegally captured, whereas if a turtle was found stranded at the beach the cause of death was classified either as boat collision, incidental entanglement in fisheries gear, or undetermined. Boat collisions were identified based on clear boat strike wounds or propeller injuries, whereas entanglements were considered when clear net derived injuries were present. We calculated annual mortality rates by dividing the number of new carcasses found at dumpsites (mean n° carcasses year-1) and at the beach (mean n° carcasses km-1 year-1) by the time elapsed between surveys, using the methodology of Senko et al. (2014). In addition, for each sea turtle reported, a decomposition stage was determined using a scale according to USGS standards (Work, 2000) which is: 1) Stranded dying animal; 2) fresh animal recently deceased; 3) animal moderately decomposed; 4) animal highly decomposed; and 5) skeletal or mummified animal. Necropsies were performed on fresh individuals in Category 2 and esophagus and stomachs were retrieved and immediately transported to the IMARPE regional laboratory in Pisco to analyze contents to determine diet composition. From stomach contents in black turtles, prey items were identified to the lowest possible taxon. Plant matter, mollusks, fish, crustaceans, jellyfish, and actinarian anemones were identified according to Dawson et al. (1964), Alamo & Valdivieso (1987), Chirichigno (1974), Retamal (1981), and Sanamyan et al. (2004). Quantitative assessment of diet was based on the relative wet weight (ww) in each sample, and was calculated as follows: %ww = (wet weight of a diet item/total weight of all items) × 100. Finally, in order to determine the dimension of the black market and extent of illegal trade, we made several visits to the Pisco central market and conducted 70 structured qualitative interviews with local fishermen; main topics were by-catch and illegal trade. Between November 2009 and March 2015, five inland dumping places were reported, mainly in the central Pisco-San Andrés area. The majority of sea turtles (85%) were registered at the main dumping site (l3°74'S, 76°20'W) and surrounding areas and the remainder (12.7%) of turtles were reported along the shorelines of Caucato, Pisco, San Andrés and Paracas (between 13°65'S and 13°86'S). A total of 953 sea turtles were registered: 92.2% (n = 898) were black turtles, 4.3% (n = 41) were olive ridleys, 1.4% (n = 13) were leatherbacks, and 0.1% (n = 1) were hawksbills. The mean CCLs were 59.2 ± 9.5 cm (range: 34.2-90.9 cm) for black turtles, 60.4 ± 6.2 cm CCL (range: 39.669.7 cm) for olive ridleys, 113 ± 18.2 cm CCL (range: 80-131.3 cm) for leatherbacks; the single juvenile hawksbill turtle had a CCL of 50.2 cm. Based on sizes observed, the life stage was determined: for black turtles, 83% were juveniles, 15.4% sub-adults and only 1.6% adults (Fig. 1), 38.5% of olive ridleys were juveniles, and 70% of leatherbacks were juveniles. The main identified cause of death of black turtles was illegal capture (89%, n = 899). For this species, stranding events were represented by only 1.4% (n = 13), and within this 0.9% were not determined (n = 8), 0.3% were due to collisions (n = 3), and 0.2% due to entanglements (n = 2) (Fig. 1). For olive ridleys, 97.5% were illegal captures and only 2.5% were standings where the cause of death was not determined. For leatherbacks, 85% were illegal captures and 15% stranded. Of the stranded leatherbacks, half showed evidence of collision and the rest was not determined. Our mean black turtle mortality estimates were 8.1 carcasses km-1 year-1 at beaches and 160.2 carcasses year-1 at dumpsites (Fig. 2). three remaining ones were black turtles in the main dumpsite of Pisco. According to the decomposition scale used, no dying animal was reported, 24.7% (n = 177) were classified as freshly deceased, 50.8% (n = 364) were moderately decomposed, 22.8% (n = 163) highly decomposed, and 1.7% (n = 12) skeletal or mummified. Five esophageal and stomach content analyses were performed during october 2014. The most consumed item, expressed in percentage of wet weight (% ww), was silverside fish (Odontesthes regia regia) eggs (47.9% ww), followed by the seaweed "yuyo" (Chondracanthus chamissoi, 31.4% ww) and the actinarian anemone Paranthus sp. (16.2% ww). 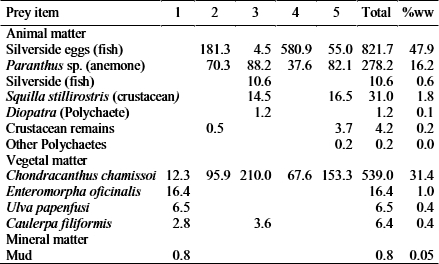 Crustaceans, polychaetes, fish, and green seaweed remains were registered in lesser amounts (Table 1). of wet weight (%ww) in the Pisco area, during October 2014. The existence of illegal trade was demonstrated. Recovered evidence at the Pisco Central fish-market observations during summer and autumn months indicates there were five ladies offering sea turtle meet for sale. Each one had approximately two turtles for sale and the price per kg varied from US$ 7 to 10. Based on our observations, we infer that between 10 to 20 turtles, mainly black turtles, are sold per week during summer and autumn months, whereas during winter and early spring season the amounts of turtle for sale were less and some weeks were totally absent from the market. As a result of the interviews, the illegal turtle trade was divided into three main activities: i) Local consumption, subdivided in family consumption by fishermen and subsistence consumption on board fishing vessels by fishermen; ii) market and other types of commercialization, subdivided in turtle meat and fins sold in the Pisco market as well as door to door sales of turtle meat in the fishing town of San Andres; and iii) demand from other towns, subdivided in demands from Lima, the capital city, and demands from Pisco nearby towns like Chincha, Cañete, and Ica. In addition, as a result of combining answers from interviews and night observations, two fishermen, pretending to catch silverside fish at Paracas, were observed landing turtles hidden inside large plastic bags. These fishermen had artisanal gillnets with a mesh size of 60 cm (the traditional measure for turtle nets). The majority of the prey items consumed by the turtles captured were animal matter, mainly represented by silverside fish eggs and anemones (Paranthus sp.) during spring, whereas during summer months the diet was mainly composed of jellyfish. There was a clear seasonality in prey consumption, with jellyfish Chrysaora plocamia consumption occurring mainly during the summer-autumn seasons and sea anemone Paranthus sp. consumption during the winter-spring seasons (Paredes, 2015). The human activity that has the largest impact on sea turtles is fisheries bycatch (Lewinson et al., 2004, 2013; Wallace et al., 2011), even worst, direct harvest remains a major threat to sea turtles population worldwide (Campbell, 2003; Lewison et al., 2013), as was previously stated a legal sea turtle fishery existed in Pisco until mid-90s, after that illegal poaching continues in the country, however sea turtles poaching does not occurred exclusively in Peru, in several countries in the Americas this illegal activity still occurs nowadays, like in the Mexican Pacific (Mancini & Koch, 2009; Mancini et al., 2011; Senko et al., 2014), the wide Caribbean area (Bell et al., 2006; Richardson et al., 2009; Lagueux et al., 2014) and Brazil (Geubert et al., 2013), in addition, this illegal activity occurs elsewhere worldwide, like in Africa (Riskas & Tiwari, 2013); Southeast Asia (Joseph et al., 2014); Oceania (Maison et al., 2010) among other places. Direct extraction, together with by-catch interaction with small scale gillnets fisheries (SSGF), is a strong factor of mortality in Peru mostly due to economic needs, lack of law enforcement and strong traditional consumption, as was reported in BC, Mexico (Mancini et al., 2011). The SSGF usually operates in nations where there are few protective measures and limited enforcement capabilities (Chuenpagdee et al., 2006; Dutton & Squires, 2008). Peru is a typical example of this situation, were an estimated of ~6000 turtles are extracted annually by SSGF (Alfaro-Shigueto et al., 2011), particularly in the Pisco area, where still nowadays fishermen are manufacturing "redes tortugueras" a traditional gill net for direct turtle harvest. In addition, retaining bycatch is a common practice in the area. Some artisanal fishermen go at sea with a wide array of legal nets; however, "redes tortugeras" are also taken and placed in hidden places on board, in order to use it "just in case" the target capture is not enough. Despite the high sampling effort, the mortality estimates presented here are underestimated for at least two reasons. First, poachers are killing turtles at sea and throwing the carcasses into the water where they go unnoticed, similar to reports from BC, Mexico (Mancini & Koch, 2009). Second, the remains could be burned between the sampling days, thereby not allowing us to find the carcasses. Yet despite this, almost 1000 carapaces were encountered in the Pisco area. The high mortality rates of 160 turtles year-1 in dumpsites and 8.1 km-1 year-1 at beaches are the consequence of a strong sampling effort (two times per week), a good spatial coverage (almost 100% of dumpsites in Pisco), and sea turtle aggregations in Pisco restricted to a small geographic area of less than 2.500 m2 and ~200 km of coastline (Velez-Zuazo et al., 2014; Quiñones et al., 2017). Is suggested that mortality rates in Pisco are likely underestimated considering that this area overlaps and interacts with a strong SSGF. There are an average of 200 SSGF boats operating in San Andrés and 100 boats in Tambo de Mora. The majority of the turtles illegally taken in Peru were small individuals, recruited from oceanic epipelagic areas to neritic areas (Luschi et al., 2003) like in the shallow waters of Paracas Bay, indeed, our black turtle size structure reflected a predominance of juveniles (over 80%), however if we compared it with information from 1987, a size decrease of ~9 cm of CCL was noticed, in marine resources fisheries population assessments revealed that age and sexual maturation (ASM) could decrease as a consequence of fishing pressure (Olsen et al., 2004; Swain et al., 2007), in the case of sea turtles, a synergy of different issues like: fishing pressure, physical and biological characteristics of the environment and density dependent factors could influence the ASM and the growth rates of sea turtles (Avens & Snover, 2013). Regarding the black market trade, the situation seems to be declining since the total ban in 1996 (Morales & Vargas, 1996). Nevertheless, we found that there are still local/regional markets that supply sea turtle meat and derived products. Though a quite strong regional trade persist in the area and this activity represents an extra income to fishermen in Pisco, where a turtle of average weight (30 kg) can be sold up to US$60 demands of some turtle derived products persist, for instance, oil and turtle blood were thought to be effective remedies against flu and other diseases in the past, even nowadays the turtle oil is still demanded by local people, each bottle of 500 mL is sold at ~US$10, instead turtle blood ingesting is no longer practiced. The trafficking structure fluctuates seasonally with a well-structured network during summer and autumn seasons and a weak and unstructured network during winter and spring seasons, however the current demand is much lower than in the former years. All these illegal activities are prone to continue unless localized law enforcement and political measures are strongly implemented in the area. Even if our data is only a fraction of the whole illegal captures and trade in the country, it provides a valuable understanding of the current situation in the Pisco area. The presented results could be useful for further management and recommendation actions.